Sacred Phoenix of Nephthys appears in this card's artwork. This card has a Spell Card counterpart: Back to Square One (though it can only target Monster Cards). You cannot target a face-up non-Continuous, non-Equip Spell or Trap Card. This is because they are already "considered to be destroyed" once they are activated (even though they are not sent to the Graveyard until the chain resolves). If you target a face-down Spell or Trap Card, the opponent can activate it as a chain. If it is not Continuous, it will not be returned to the top of the Deck. It will be placed in the Graveyard after the chain resolves, as normal. 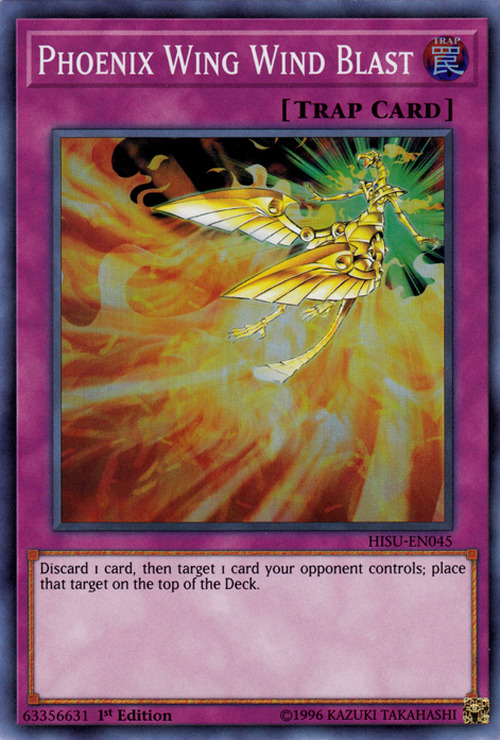 You can activate "Phoenix Wing Wind Blast" and target a face-up "Swords of Revealing Light" because it destroys itself by its own effect, instead of being destroyed when activated, like most Normal Spell Cards.